Several people have recently commented on the Laguna Dust Collectors. It is interesting as several different companies have marketed similar looking ones including Laguna, Jet, JDS and others. 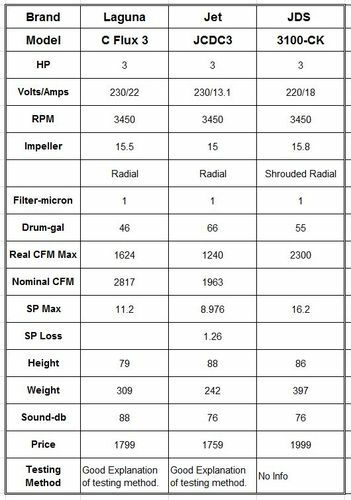 I was curious about them so I gathered the information for three of them to make a comparison of the 3 HP models. They all look pretty similar with a relatively short cone and mounted on wheels. Below is a picture of the three collectors. I also put together a table comparing the three machines. 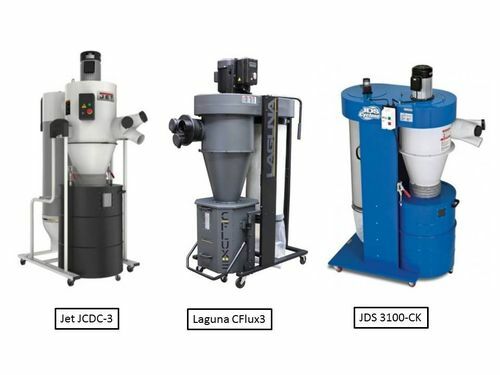 They all are pretty similar but the JDS machine stands out from the others. The Jet and Laguna both have radial fans and the JDS has a shrouded radial fan. In addition, the JDS is heavier than the others by almost 100 pounds. Below is a picture of the JDS fan. My understanding is that the shrouded radial fan can provided higher pressure but also can tend to clog with shavings being caught in the fan. But the big thing was the performance curve of the JDS. It is the best performing of the three especially at high static pressures. In fact, the curve shows 1000 cfm at 12” sp. 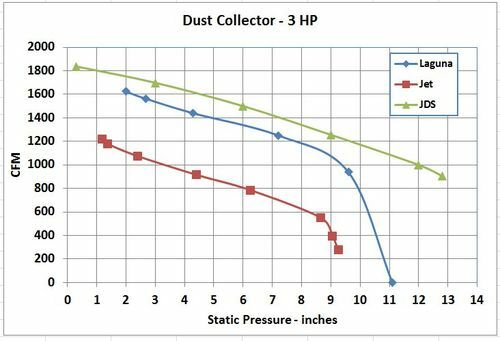 This is pretty extraordinary for any 3 HP dust collector. In addition, they claim a max static pressure of 16.2”. I will have to note that I have no idea how JDS ran the tests. I have contacted them for that information but have gotten nothing. I did get the test procedure for the Jet and Laguna and the testing is done well. If I had to pick between the three machines, the JDS would have to be the one based upon the performance data provided by JDS. However, I have not read any reviews in a forum of the unit and would therefore be hesitant. This machine does not seem to be available. The only reviews that I found were on Amazon. There were two reviews there that were verified purchasers but these were from 2009 and 2010 and were positive reviews. A similar machine is available in Europe by Axminster. It seems a bit strange that it was available years ago and in Europe and not now in the US. It would be great for anyone who has one of these machines to run some performance testing to validate the manufacturer test results. This would be especially interesting for the JDS unit. If the claims are correct, this is the best dust collector that I have found. What I do not understand, if the claims are true, why have we not seen it on the forums. And, why is the JDS not available and so few comments on forums. Kirkland “Outdoor Cleanup” bags from Costco fit the drum perfectly. The drum is larger in circumference than a standard 55 gal drum, so drum liners won’t work. It’s been a great machine, my only two complaints are minor. - In my installation, the sides of the unit are not visible. I often forget to check the rear bag when emptying the machine. I’ve had several occasions where the rear bag filled, and it was a huge PITA to clean out and empty. An opening in the panel that connects the two uprights would make it easy to see the rear bag from the front. One of these days, I’m going to cut a view window, but it’s been on my to-do list for years. - The paddles on the automatic filter beater on mine have broken off. I’m not going to hold this against JDS, as I’m sure my fill mistakes with the rear bag put stresses on the assembly far beyond normal. The part is not available as a spare. In the first year of ownership, I had an issue with the timer that controls the filter beater. Since my unit was an early production model, JDS had changed the entire switch assembly, adding a remote control after my unit was sold. To their credit, JDS provided me with everything required to update my unit to the production standard at the time, including a new mangnetic switch and remote system, free of charge. I’m not sure it’s still available, but if I needed another cyclone to fit under a low ceiling, I’d buy it again in a heartbeat. I am glad to hear someone has one and is happy with the JDS. Do you think it really has such high flow at such high static pressure. The numbers are just extraordinary for the high static pressure. It would be nice if someone had tested it. Oggie’s comment about filling the bag with fine dust confirms my suspicions that the short cyclones on some portable units don’t have the best separation. I have a 2 hp Tempest cyclone mounted to the wall. The separation is so effective, that I only ever see a thin layer of fine dust in the canister. The directions say to clean the filter and cleanout every 6 months, but it’s more to check that the system is working properly. Basically there is nothing to clean out. Realize that duct design has a role in separation efficiency as well. For instance a straight horizontal pipe into the cyclone will have less turbulence, and can give better separation. I went from a 1 hp basic bag-type collector to the 2 hp cyclone. Suction is off the charts, and even my 4” ports measure 600 cfm. That is about as good as one can do through a 4” port. There is significant effort, cost, and operational hassle to switch everything to 6” ports. My main point is the flow charts may indicate a certain brand with maximum CFM at a certain SP resistance. However, if your tool port chokes down to 4”, 2-1/2”, or 2” at some point it really doesn’t matter. You’ll never get 2000 or even 800 CFM through a small pipe. Also we tend to look at the maximum numbers, which are seldom the real-world reality. I think any of those cyclones would be a drastic improvement over any single stage collector. I have looked at both versions of the Laguna, and the Jet cyclones as well. They appear to have good build quality, and great features. The paddle-type filter cleaners address the less than ideal separation, so that is a positive point. The one thing that stands out to me on your statistics table is the dB level of the C-Flux. 88 dB is a world of difference from 76 dB. Those are the kind of things you’ll notice in your shop. Horsepower to some extent can be unimportant. As one example, the 2hp and 3hp Tempest stationary cyclones tested at exactly the same performance on a flow chart. The RPM and fan diameter are identical, so it stands to reason that they perform the same. Whatever you buy, make sure it has a neutral vane type setup. Grizzly calls theirs a ramped inlet, but functions in a similar fashion. A neutral vane helps improve separation. And finally, if separation isn’t good, those flowcharts of a shiny new machine don’t mean much. Good separation means a cleaner filter, and good real-world performance. The down to earth woodworker installed a big JDS a few years back and did a video series on the DC and installing the ducting system, very detailed. Not sure of the model. When I inquired last July, the JDS was not available. They expected to get them in by early October. If they’re still not in, I’d guess big production problems in China or money problems. Oggie’s comment about filling the bag with fine dust confirms my suspicions that the short cyclones on some portable units don’t have the best separation. My unit is so early, it was made before the bag retainer existed. I use a 33 gallon plastic trash can with the bottom cut out as a retainer, pulling it out once the bottom drum is about 1/4 full. Thanks for clarifying, that sounds totally reasonable. Great timing on this post. I’m looking to add a cyclone collector to my basement and at 7ft tall I don’t have alot of options. I was considering the Laguna 3HP Pflux. The main difference from the C seems to be lower DB, better filtration, and a little more electronic gadgetry. Will probably pick up when they go on sale again. You guys think the added benefits justify the $500 difference over the CFlux series? I think the improved filtration is a benefit. The PFlux has a HEPA Filter. The db ratings of these units are “suspect” due to the conditions they are tested under. Most are tested in a factory where the ceiling height is 20 – 30 ft and the room may be over 5000 sq/ft. A unit that test at 75 db under a 20’ ceiling will probably produce better than 90 db in a room with a 8’ ceiling. The sound performance is always relative to the operating environment. English – you did a good job reducing the noise. Anyone interested in DC noise reduction should take a look. I wonder if PVC pipe instead of metal would result in noise reduction? PVC would reduce noise some, but it’s not worth the negatives compared with metal. Most of the noise comes from the intake and exhaust pipes directly connected to the cyclone body, and particularly through the filter.